When Marlen Saenz began selling picture frames at a local flea market 12 years ago, she never dreamed her little business would grow to where it is now after receiving a $1.3-million SBA 504 Real Estate & Equipment Loan. At the U.S. Small Business Administration, we know business success can be achieved with the right tools. And Saenz is just one of the 54,773 reasons the Rio Grande Valley has to celebrate National Women’s Small Business Month. Nationally, more than 9.4 million firms are owned by women, employing nearly 7.9 million people and generating $1.5 trillion in sales in 2015. Women-owned firms account for 31 percent of all privately held firms and contribute 14 percent of employment and 12 percent of revenues. In the Valley there are 54,773 women who own small businesses, representing 43 percent of all small businesses which, according to the U.S. Census Bureau, is 12 percent higher than the national average. Saenz described how a customer who enjoyed her frames wanted to enhance the style of his house. The gentleman asked her if she’d be willing to decorate his home, and the rest is history. Guests at his housewarming party at Thanksgiving soon asked for her services, and from there she started decorating schools, hospitals, attorney’s offices and the courthouse in the small rural town of Rio Grande City. After two years at the flea market, she opened Marlen’s Gallery in a leased building in Rio Grande City. Two years later she owner-financed the purchase of her current location at 405 E. 2nd Street, which she has occupied for more than eight years and now has eight full-time employees. Then, in February 2017, Saenz made the biggest move of her career with the help of an SBA loan, opening an additional location in McAllen, where she has hired additional employees. Marlen’s Gallery in McAllen is a 31,240-square-foot facility at 1000 E. Highway 83. The new location accommodates her beautifully selected pieces, home accessories, oil paintings and highlights one-of-a-kind furniture she designs. 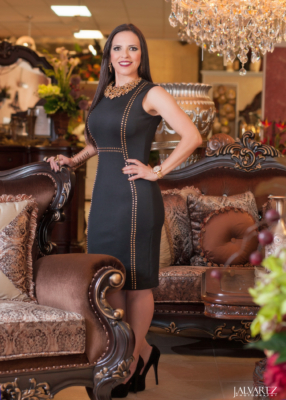 Although she does have challenges competing with larger furniture stores, many of which are owned by men, she said it is not a huge obstacle as many of the larger wholesalers now open their doors to her because she has built a good reputation as a business woman. Saenz says the greatest benefits of owning her own business are having the flexibility to be her own boss while working at something she loves and enjoys. “I feel as though I would be a different person if I did something I didn’t like,” she said. Over the past few years, women have made unquestionable progress in starting and growing their own businesses in the Rio Grande Valley. Women’s Small Business Month is a perfect time to recognize the advancements made by women in business and celebrate women business owners.